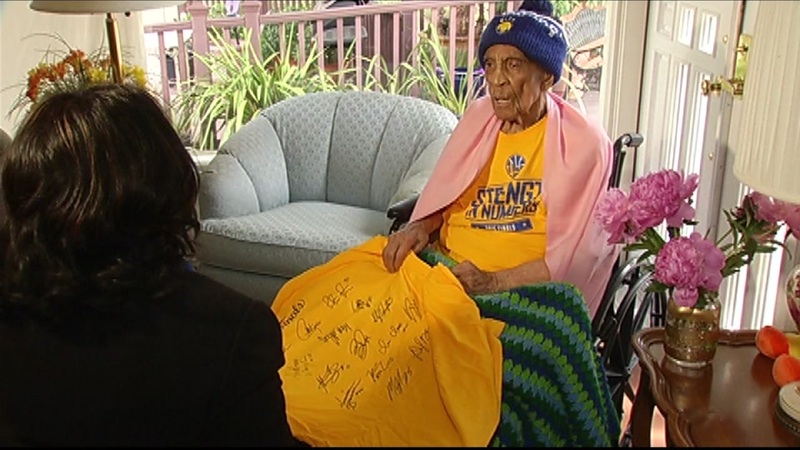 OAKLAND, Calif. (KGO) -- Dub Nation has lost its matriarch. Helen Brooks, the 107-year-old super fan known as Sweetie, has passed away. Sweetie was at an assisted care facility in Castro Valley surrounded by family and loving caregivers when she passed. Sweetie had been following the team for years and her devotion got a shout out from Coach Steve Kerr this past season. "Sweetie, if you're watching out there, congrats," he said at a news conference. Sweetie: "Oh yes. I watch them and fuss at them, too." ABC7's Carolyn Tyler: "What do you fuss at them about?" Sweetie: "If they don't do what I want them to do. I know they can't hear me, it's kind of stupid, but I do it anyway." Her favorite was 23, Draymond Green. "I love to watch him," he said. "He has grace." The Warriors released a statement saying, "We are saddened to hear the news about the death of one of our biggest fans, Sweetie. Her enthusiasm and zest for life and the Warriors were second to none, even as she surpassed the century mark. Sweetie's presence at Oracle Arena during our championship season was as big of a thrill for us as it was for her. Our thoughts and prayers go out to her family and friends during this difficult time."